David Boudia sounded like a real jerk. While he was a successful athlete, he was rude, arrogant, entitled and had no time for anyone who wouldn't benefit him in some way. He also used every opportunity to abuse cigarettes and alcohol -- and marijuana when he thought there were no drug tests on his horizon. OK, maybe he didn't ever reach Ryan Lochte's level of jerkdom, but he was up there giving ol' Ryan a run for his money. 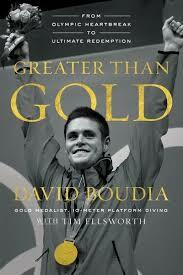 Greater Than Gold describes Boudia's change of heart and attitude that allowed him to overcome his disastrous showing in the 2008 Beijing Olympics (where he won no medals) to becoming a more grateful, focused athlete who was able to bring home medals from the next two Olympics competitions. David was born into a Catholic family with two hard-working parents and two older sisters. In order to channel his boundless energy, his parents signed the young boy up for gymnastics lessons. He soon realized that no matter how successful he was in the sport, no matter how much praise and recognition he received, he always wanted more and to be the center of attention. Eventually, he got burned out on gymnastics but had discovered diving. He (and his family) poured all his energy (and lots of time and money) into his diving training. He was crushed after his performance in the 2008 Beijing Olympics, and decided that rather than turn pro (where he would earn a lot of money very quickly) he would go on to college. His Purdue coach, Adam, was patient and able to reign in the impatient Boudia and help him to focus on the process of earning a medal, rather than rushing headlong toward glory (which didn't work out so well in Beijing). Because of his earlier successes in the sport, Boudia was somewhat famous on campus. This did nothing to reduce his partying out-of-control lifestyle. One day in his sophomore year, he had something of a crisis, which led to a long talk with his coach Adam and Adam's wife Kimiko. Due to his feeling so low despite all of his outward successes, Boudia was receptive to their Christian message. He was baptized and began to work not for glory and adulation for himself, but to use his sport and talent to bring glory to God. He also got married and had a child, two things which tend to help most party-animals slow down! Although he ultimately achieved Olympic glory in London in 2012, Boudia has had to struggle with the fame and the realization that achieving his goal weren't as satisfying as he thought they would be. It was interesting to read about his struggles with hubris and how he became more process-oriented rather than goal-oriented to achieve success. Still, even though he's worked hard and achieved great things, there were many instances where he had to remind readers of his success ("I won Big 10 Athlete of the Week again?"). It sounds like even after all his achievements, he still struggles with his ego and sense of entitlement.